Transposition of the great arteries (D-TGA) is a conotruncal abnormality characterized by discordant ventricular-arterial connections. In D-TGA, the aorta arises from the right ventricle and pulmonary artery arises from the left ventricle. The aorta is anterior and rightward. 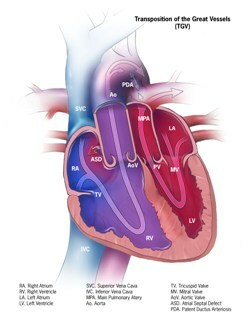 The pulmonary and aortic circulations are in parallel instead of in series. D-TGA occurs in ~31.5 in 100,000 live births. It is the 10th most common form of congenital heart disease, and the second most common cyanotic heart disease following Tetralogy of Fallot. There is a male predominance (2:1 male to female ratio). It is usually not hereditary, however, infants of diabetic mothers are at increased risk. Ventricular septum: Intact (60%) vs Ventricular septal defect (VSD) (40%). Hypoplastic aortic arch/Coarctation of aorta. Right ventricular outflow tract obstruction. Left ventricular outflow tract obstruction. Prenatally: Fetal echocardiogram. Apical 4 chamber sweep demonstrates parallel great arteries with a lack of crossing of the great vessels. This diagnosis can be missed if the fetal ultrasound does not sweep to the outflow tracts, highlighting the importance of this view. Cyanosis: Usually diagnosis happens shortly after birth due to parallel systemic and pulmonary circulatory systems. Neonates will be more cyanotic if there is poor intracardiac mixing between the parallel circulations (restrictive or intact atrial septum). If cyanosis is severe, neonates will need an urgent balloon atrial septostomy to improve mixing +/- prostaglandins to keep PDA patent (another site of mixing). Reverse Differential Cyanosis: In some cases, neonates can present with reverse differential cyanosis (defined as higher saturation in lower extremities compared to upper extremities) from right to left shunting at the PDA in cases of D-TGA with coarctation, D-TGA with pulmonary hypertension or D-TGA with interrupted aortic arch (IAA). Balloon atrial septostomy: In case of insufficient blood mixing/shunting and restrictive PFO or intact atrial septum. Arterial switch operation (ASO or Jatene operation) with LeCompte maneuvre: Currently is the most frequent procedure. First time successfully performed in 1975, and it is the preferred surgery (if possible) since 1980’s. It consists in transecting the great arteries and switching them to the other semilunar valve. This way, the aorta with coronary arteries get translocated to the native-pulmonary artery valve and the pulmonary artery gets translocated to the native-aortic valve. LeCompte maneuver consists in positioning of the pulmonary artey and main right and left branches anteriorly to the aorta to avoid distortion. Atrial switch operation, also known as Mustard or Senning procedure: They were the palliative procedure of choice between 1960-1980’s. Senning procedure: Same principle as Mustard procedure, but utilizes atrial tissue to baffle systemic venous return to mitral valve and pulmonary venous return to tricuspid. Rastelli procedure: It consists of baffling the aorta to the left ventricle and using a right ventricle to pulmonary artery conduit. Baffling depends in the side of the VSD. Complications: Left ventricular outflow tract obstruction, conduit stenosis or regurgitation, formation of pseudoaneurysm next to the conduit. Nikaidoh procedure: It consists in mobilizing the aortic root and coronary arteries posteriorly, doing a LeCompte maneuver, resecting the main pulmonary artery and replacing it with a right ventricle to pulmonary artery conduit and closing the VSD with a patch. REV (Reparation a l’etage ventriculare) procedure: Main pulmonary artery and ascending aorta are detached, to perform a LeCompte maneuver. Ascending aorta is reattached to the aorta. Baffling of aorta to the left ventricle using the VSD. Oversewing of the pulmonary valve with detachment of the main pulmonary artery with direct anastomosis of the MPA to the RV (RV to PA connection with native tissue without a conduit). Moodie. 2014. Clinical management of congenital heart disease from infancy to adulthood. Cohen. 2016. Multimodality Imaging Guidelines of Patients with Transposition of the Great Arteries: A Report from the American Society of Echocardiography Developed in Collaboration with the Society for Cardiovascular Magnetic Resonance and the Society of Cardiovascular Computed Tomography. J Am Soc Echocardiogr. 2016 Jul;29(7):571-621.